Not much to report today, we just had a safe journey from Gilsland over to Alnwick and we are now settled in on a little farm called East Cawledge. Our immediate neighbours are 3 horses in the field which is about 2 metres from our front windscreen - they very often wander over to have a nosey at what we're doing. The weather's not very good - more wind and rain, so we're going to put the heating on, put our feet up and have a lazy afternoon. The heavy rain had continued overnight and occasionally disturbed our sleep, however, when we got up the sun was glimmering through the clouds so we decided to head into Alnwick. John had discovered, via the internet, Alnwick Gardens which looked as if it would have plenty to entertain us, so we made this our first port of call. 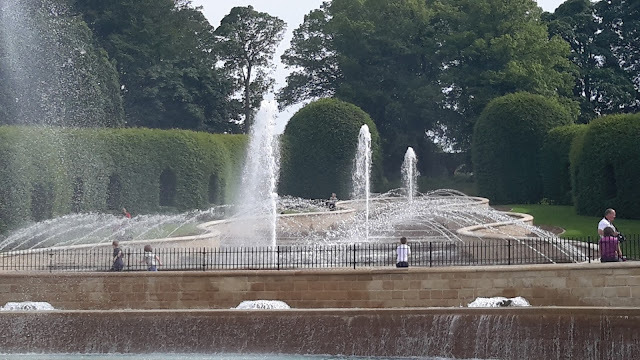 This attraction is owned by The Duchess of Northumberland, and although very little was in flower, the only way to describe it is, as spectacular, and for those interested we have included this link alnwickgarden.com. The is the cascade that meets you as you walk through the entrance - it's quite breathtaking in it's splendour, and we could only imagine the beauty of what will come later in the year, thus we definitely plan to come back. We set off on our exploration though the many domains, which included the serpent garden where there are lots fountains, the poison garden where they grow cannabis and mandrake (see Harry Potter), and the ornamental garden to name but a few. John took loads of photos, a few of which are below. Around lunch time the heavens opened and added massively to the water features, so as the timing was good, we made a dash to the cafe for refreshments. The storm was quite spectacular so we just sat and watched for a while. Once the rain had cleared we wondered into Alnwick town, but as it was Sunday nearly everything was closed, and as the rain continued to threaten we strolled back to the Tardis via Sainsbury's for more refreshments!! Today was another cycling day. We set off to use the cycle path at the side of The Aln Valley Railway, which according to their web site, runs from Alnwick to Alnmouth. However, after negotiating a very muddy dirt track down to the supposed route there was no cycle track and no rail track either! (have they run out of money?). Oh well, plan B and back to the road! We tootled across country to Alnmouth, and once in the town it brought back memories of our time with Sharon and Paul when we rode The Coast and Castle's route. We paused for a coffee break at the bench we had previously used, and sat for a while in the sunshine and reminisced. From there we carried on following Sustran's route 1 towards Craster where we planned to have fish and chips for lunch. At Boulmer there is an option to follow the road, or as we did, follow the coastal path (off road route). We arrived in Craster, but alas, no chippy! So instead we had to settle for smoked chowder for John and Spicy salmon wrap for me - both excellent (Yum). We were contemplating adding cake, but suddenly the cafe became very busy so we decided to head towards Dunstanburgh Castle and sat on the sea shore (as we did before), and ate own cake washed down with hot choc. By this time the hours were passing, the clouds were rolling in and the wind was picking up, so we decided to head for home and a nice cup of tea! We had about 7 miles to go and all of it was against a strong head wind, so by the time we got back we were quite exhausted. Therefore, along with the tea we had quadruple choc biscuits! Very well deserved. Tomorrow we plan to head for the coast at Seahouses, and if our luck is in, maybe our first spot of wild camping. We'll let you know how we go on.